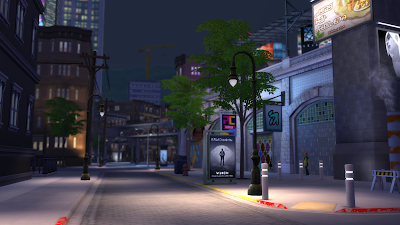 XUrbanSimsX Official Website: THE SIMS 4 || CITY LIVING | EXCLUSIVE ACCESS + FIRST LOOK. THE SIMS 4 || CITY LIVING | EXCLUSIVE ACCESS + FIRST LOOK. Hello my loves, so as you know. 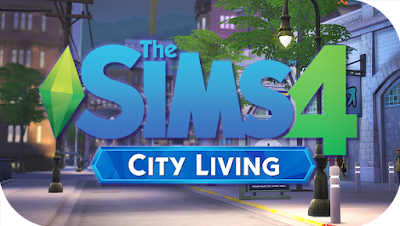 I got the opportunity to take a sneak peak inside the new city living EP! Down below is some more information about my experience and a verbal overview of my video on City LIVING ENJOYYY! Below I will be breaking up in the information in sections, to make browsing easier. I will try to include as much as I can remember and even then some in which I couldn't fit into my video. 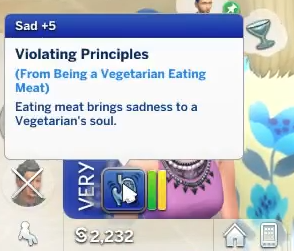 -Vegetarian, When your sim eats meat or things containing meat. They get a sad moonlit. For Violating THEIR PRINCIPLES!! Unfortunately, as a result, they end up getting sick later. If you're like me at all (which thank god you're probably not) you've been waiting for new clothes!! Let me tell you this pack isn't lacking at all. There are many types of new items to expand your sims wardrobe pallet! Inspired by ; Morrocan, Japanese and Indian fashion these items are sure to wow you. 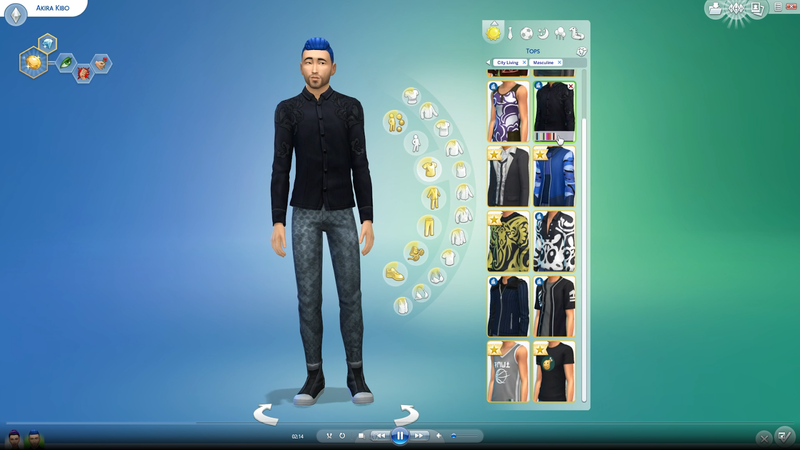 However, if your sim wants something a little more westernized and fashion forward THEY'VE GOT YOU COVERED! (No Puns PLEASE) Literally! Although not shown, even the little kiddos get some loving! 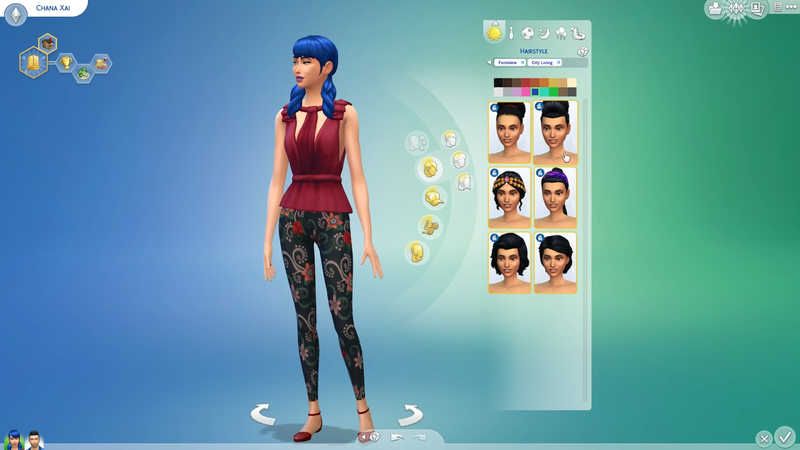 With all the diversity in CAS, you bet your bottom dollar I was expecting the same royal treatment in the hair department. To only be greeted with a small selection, was slightly disappointing. In the Woman's Section, I liked 4/6 hairs the last two remind me of my Joe Dirt Family Portrait days back in the 90's. (Long Story) In my personal opinion, they seem outdated and lack that OOMPH that all the new clothes bring to the table. Now the gentlemen. This sim here btw was the ALL STAR of the whole room. 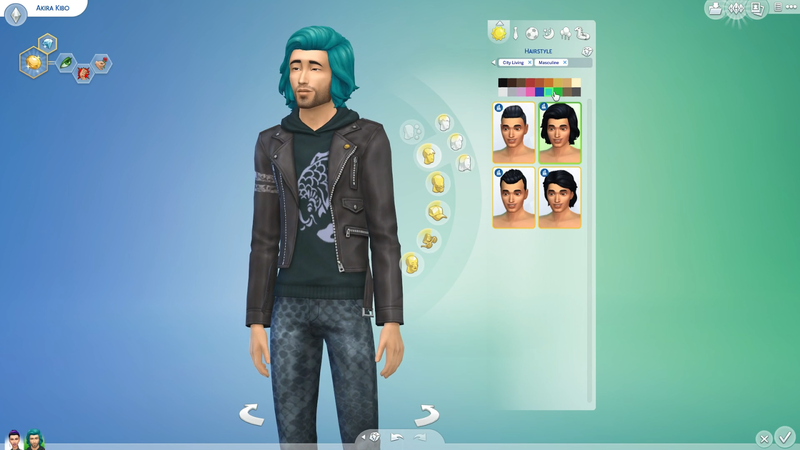 I can't how many people shacked their sims up with him. He's a hottie, not going to lie. Chana may have been a little jealous at how easily he gave his heart away , however. Okay, back on topic. Men's Hairs. I feel like the shaggy 90's styles work for the men. However, the very last one still couldn't impress me. The Man-bun (first hair) Honestly. Not in favorite in real life, but SUPER on trend and that's what I would have loved to of seen in the woman's hairs. Spacebuns, Messy buns, Arianna grande hair, maybe even some braids?? I thought Windenburg was stunning when I saw it, and that still holds true. However NEVER in a million years did I fathom how truly breathtaking San Muyshuno is! With the team gathering inspiration from some of the world's biggest cities you knew it had to be nothing short of mindblowing! All shine through and its obvious!! There is a total of 4, liveable districts. 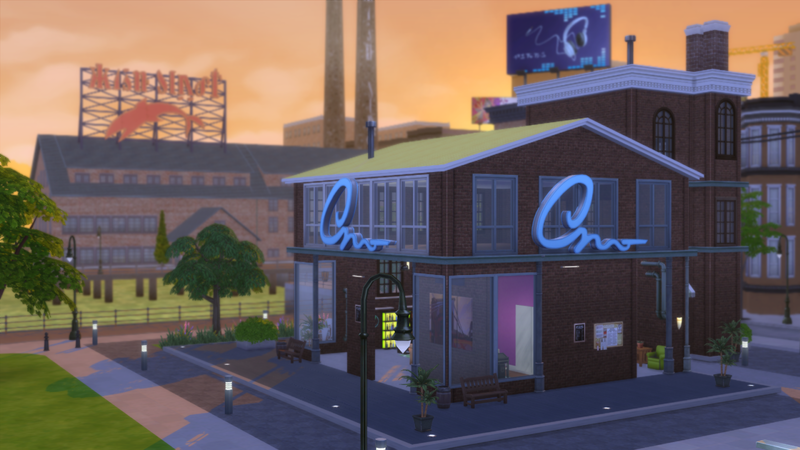 Spice Market; Which is home to affordable housing and in my personal opinion the most diverse of the 4 Districts. Fashion District, Uptown, Arts Quarter. 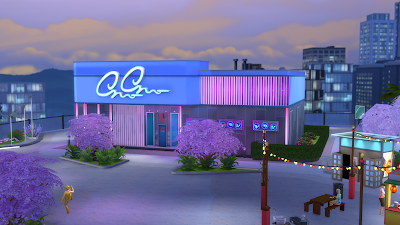 There are two karaoke bars, and warehouses where you can throw parties or be invited to concerts. Finally NEW CAREERS! A moment I think we all can appreciate! There are 3 to choose from! You can judge the food or critic the arts! Later, having the option to branch into a specific critic career such as an Art or Food Critic! your sims can create their online social media profile to get started, blog for followers and later branch into one of two careers. 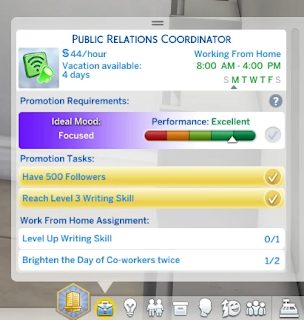 Internet Personality OR Public Relations! I had so much fun with this career I progressed to nearly level 6 by day ONE of sims camp! Not easy, just FUN! There's a place where you can get onto a podium and STAT YOUR CAUSE. Branches Into Politician or Charirty Organizer!! With ANY of these 3 Careers, you have the ability to skip physically going into work for the day and take matters into your own hands and complete tasks from home with various work assignments! It's a super fun, and entertaining way to get the job done. Even if you are stuck on the same level for a few days, your tasks change. They aren't redundant at all. 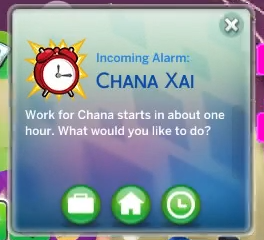 When it's time for work your sims will get a notification where they can choose to stay and work from home or go to work. Apartments come in all shapes and sizes and now with PERSONALITIES? That's right there are 25 new lot traits you can add to your apartment and homes. You can choose up to 3! Some apartments come with secret traits, Such as Serviced Apartments (Includes Maid Service) and Romantic Fireplaces. 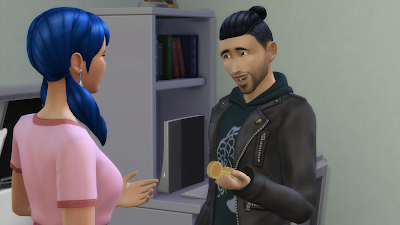 My Favorite traits are Penny Pixies, where your sims can find loose change around the house and QUAKE ZONE! Which gives your lot a chance of TREMORS happening! 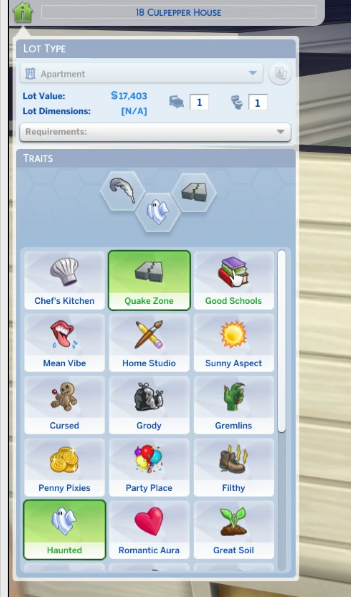 Keep in mind you can use this Traits on ANY LOT, ANY HOUSE OR APARTMENT IN ANY WORLD! How cool! In order to move into the apartment, you need to put down a deposit and rent is due weekly. Meet your neighbors and get acquainted. Oh, let the shenanigans begin! Some neighbors have no courtesy and can be heard woohooing ALL NIGHT LONG! Go over and give them a piece of your mind or invite them over for a little dinner! Give your long time friend Acess to your digs; or is it time to take the next step in your relationship? Pass them a key and they will drop by anytime unannounced EVENT style! Meaning a window will pop up similar to when you have a neighborhood welcoming session. 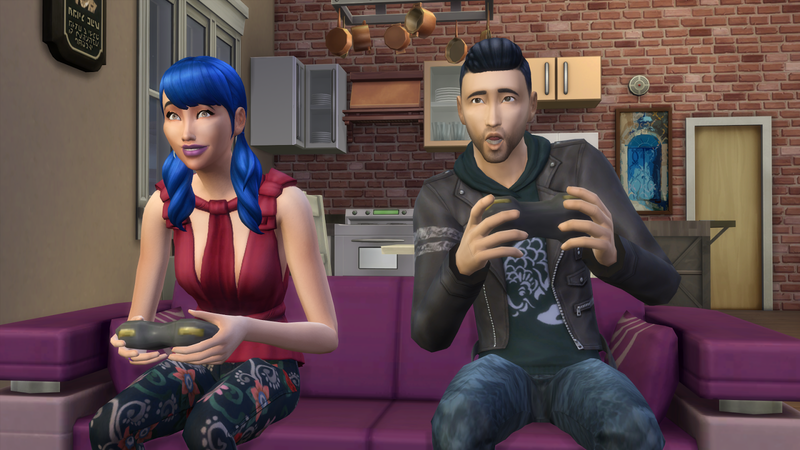 New Objects such as, Musical Keyboards, Gaming Consols and CURVED Objects such as a new TV and Computer station will make their debut!! My personal favorite. I am and was so excited to hear these making a comeback! There are two to pick from. A cheaper version for 399 and a pricier version for 799! New features include. Playing online with friends! Enter GAME tournaments to win $$ 3 new games and also multiplayer! NEW TV STATIONS HAVE BEEN ADDED! Civil Public Access, SITCOMS, News, World Culture, and Politics!! 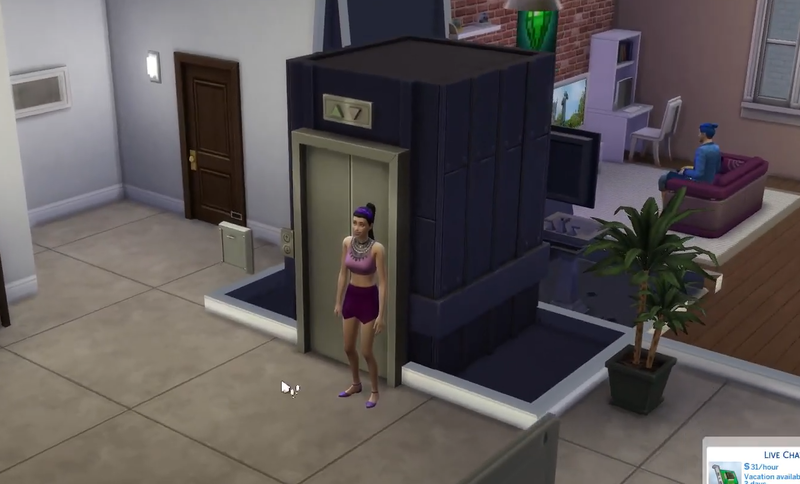 One of the biggest questions I've been getting is how do elevators function. They act as teleporting objects unfortunately from the ground level to the top floor. So your sims will go inside and appear on the street below their apartment. These are not objects we can place in other lots and there is NO WOOHOO options, BUMMER! HOWEVER YOU CAN USE THEM IN PENTHOUSES! Although there isn't any new woohoo spots. There is a new death! If your sim ingests a poorly made plate of Pufferfish. It could be lights out, permanently. You have the ability to learn how to make this dish by snagging a plate at the local food Kiosk and learning how to prepare the dish yourself! Heck, make an entire restaurant that ONLY sells pufferfish...We won't judge you! 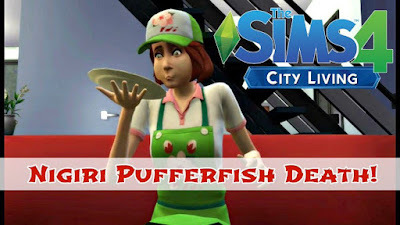 CHECK OUT RORYSIMS VIDEO FOOTAGE ON THE RARE PUFFERFISH DEATH! There are two hidden skills, Chopsticks, and Heat Tolerance. 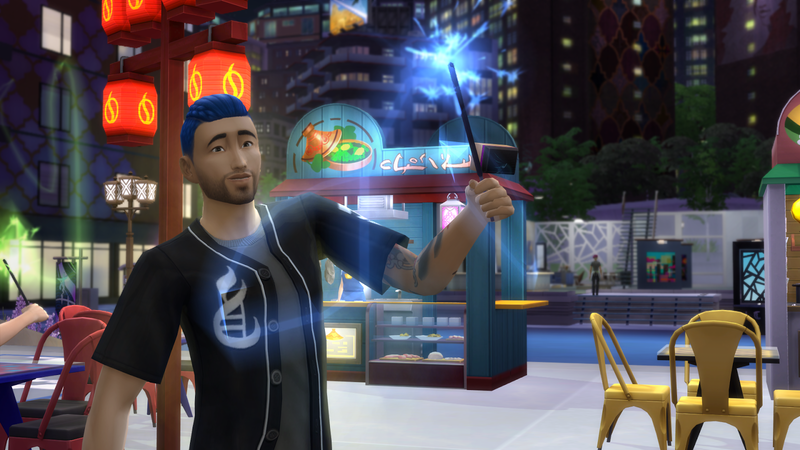 Chopsticks; Sims who try foods with chopsticks will improve their technique over time! Heat Tolerance; The more exposure your sims get with spicy foods the more tolerant they'll become. Super handy when winning the SPICE CHALLENGE at the Spice festival! BE INVITED ; To concerts in warehouses or out to festivals with new goals to complete!! 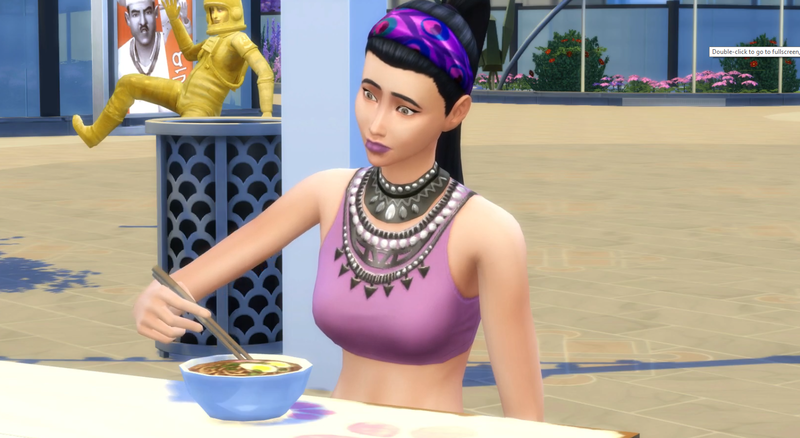 RECIPES; If you love cooking as much as I do in TS4 then you'll be excited to know that there are 27 new learnable recipes, you can discover how to make them by trying them out at the food stalls! 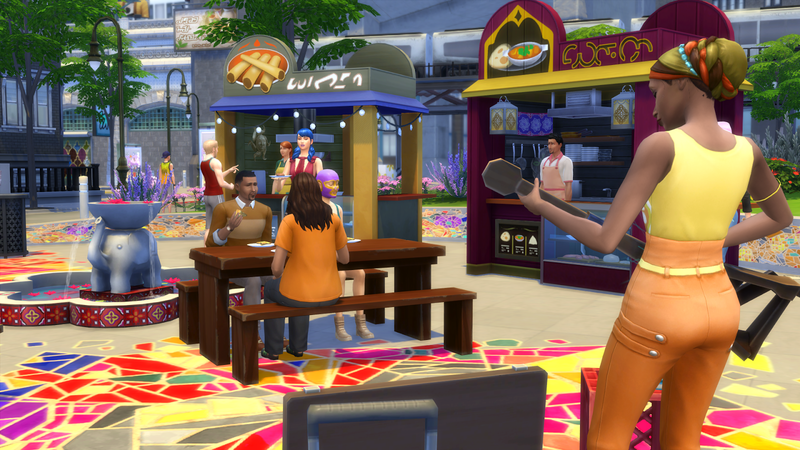 FOOD STANDS; There are 8 total new food carts and even I didn't get a chance to see them all. They are always changing and open and close at random times! There are; Mexican, Chinese, Produce and Drink Carts to name a few! 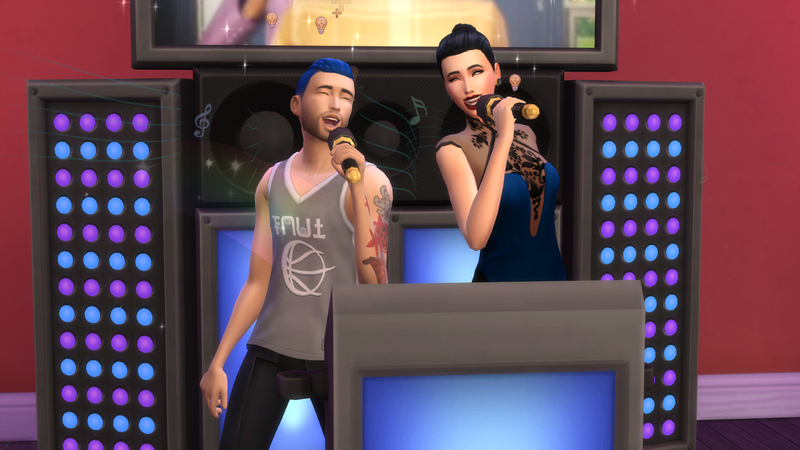 KARAOKE CONTESTS; Test out your vocal talents by entering the weekly contests! They are on Sunday, Tuesday, and Thursday @ 8pm so, DON'T BE LATE! In duets the animations are so cute. 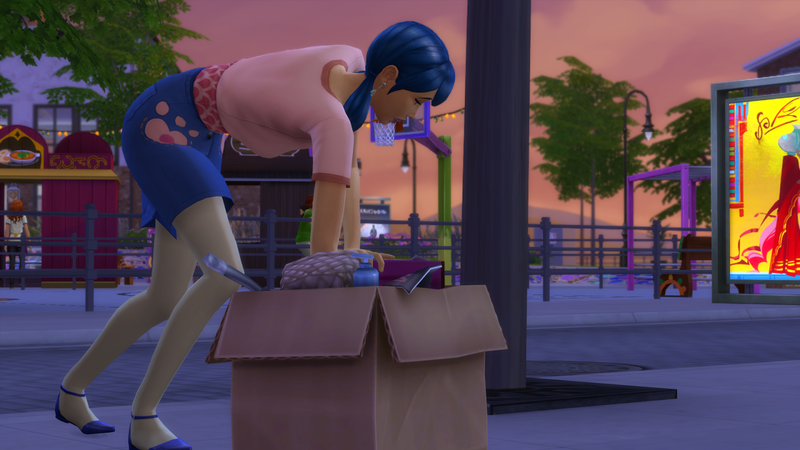 Depending on your sims relationships they will behave a certain way! As you can see these two are KILLING IT! 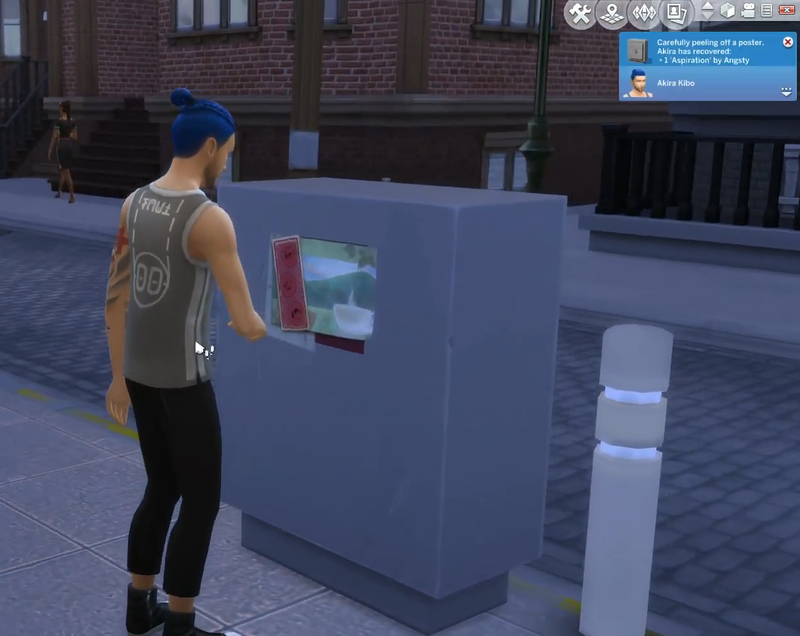 One of the things I adored about the sims 3 where the vast variety of collectibles, so seeing more of these makes me so happy inside. 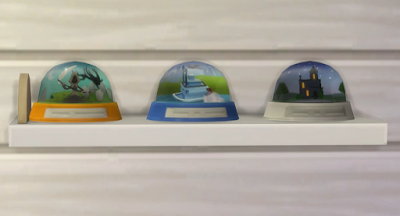 SNOWGLOBES ; There is a total of 15 collectible snowglobes your sim can find, at the flea market swag stands, and even in random boxes in the city around them like above. Each snow globe comes with its own unique animation. HOW CUTE! POSTERS; Around the city, you can find posters, or flyers rather and take them home to display! There are quite a few festivals and they rotate weekly with 2 on average. There is; The Love Festival, Geek Con which you can take selfies with cosplayers participate in the hackathon and improve gaming skills and more. Spice Festival; Harvest Spices, Cowplants, and other rare plants! Sample Foods and PARTAKE in the Spice Contest! Humor and Hijinks; Stand-up performances and mischief galore! Pick a side and cause havoc! Stay for the firework show and buy all the swag your heart desires! Fleamarket; Are your sims looking to hustle for that new penthouse? Or look to furnish your new apartment on a budget! Well, you're in luck! You can put your crafts and nicknacks on a table and sell away! If you're missing that ONE PESKY Snowglobe to complete your collection, maybe you can trade it with someone here? 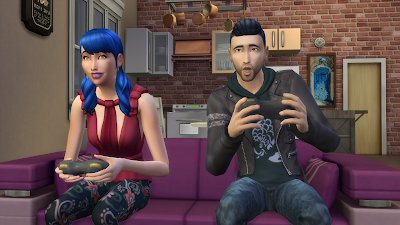 I didn't get a chance to explore penthouses sadly, but there are a ton of simmers who did, and have! Down below there will be links to EVERYONE's VIDEOS AT SIMS CAMP. CHECK THEM OUT! Hope you all enjoyed this super long blog! I certainly enjoyed writing it and so now the countdown begins!! The blog was great you shared a lot of information and that was great thank you.